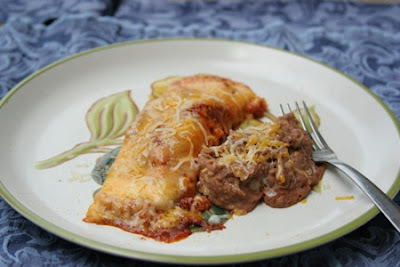 cardigans and kids: enchilada recipe. It took me many years of requests to try making enchiladas with corn tortillas, and too many flour tortillas that ended up soggy, to stumble upon these. I am so glad I finally found a red sauce I liked and gave these a try. When craving Mexican, these hit the spot. enchiladas with a red sauce. -1 c. shredded cooked chicken, ground hamburger, onions (what ever you want to fill your tortilla with). In a large pot, heat the oil, flour and chili powder together. Allow to cook for 1-2 minutes. Add the remaining ingredients and bring to a slow simmer. Stir well to combine and so the tomato sauce is dissolved in the water. After it has simmered 8-10 minutes, remove from the heat. Preheat oven to 350 F. Pour some of the sauce into a 9 x 13 pan. Then make the enchiladas. Now the messy part. Pick up a tortilla with a pair of tongs and dip in the sauce, be careful since the sauce is still hot. Make sure the enchilada is covered but not dripping (I wipe it off with my hand if I need to) and fill. Place in the pan. After I have filled them all I pour the remaining red sauce over the enchiladas and then cover with the remaining cheese. Bake for 20 minutes.